THE STORY - Tired of living a solitary life in the Pacific Northwest, Mr Link, who is 8 feet tall and covered in fur, recruits fearless explorer Sir Lionel Frost to guide him on a journey to find his long-lost relatives in the fabled valley of Shangri-La. Along with adventurer Adelina Fortnight, the trio encounters their fair share of peril as they travel to the far reaches of the world. Through it all, they learn that sometimes one can find a family in the places one least expects. THE GOOD - Hugh Jackman's colorful voiceover performance. Astounding stop motion animation and production design. An abundance of amusing visual gags and slapstick comedy. ​​​​Laika has pushed the boundaries of stop motion animation to new levels with each of its films. Most recently, it produced only the second animated feature ever to receive a Visual Effects Oscar Nomination ("Kubo And The Two Strings"). And now, it has topped itself again, producing one of the most visually impressive stop motion films in history. Boasting dozens of characters and entire continents worth of locations, "Missing Link" is a triumph of animation technology. In addition, it happens to be very charming in the process. “Missing Link” follows wannabe Victorian adventurer Sir Lionel Frost (Hugh Jackman) as he sets out to the American west to prove his bona fides by obtaining proof of the mythical bigfoot. Instead of a fearsome creature, he finds the lovable lunk Susan (Zack Galifianakis) who sends him out on a journey to the Himalayas to find the equally mythical Yetis. Laika's stop motion animation has always been impressive, but the sheer scale here is absolutely wild. The animators, VFX artists, and production design team have designed sprawling sets, from massive overhead views of Victorian England to Indian jungles to Tibetan Temples to Old Western towns. The film’s most impressive set, however, is a massive Ocean liner that ends up hosting an “Inception”-style spinning fight scene. The VFX artists also seamlessly incorporate elements such as water and smoke into the animation. It is impossible to tell where the stop motion ends and the CGI begins. “Missing Link,” without a doubt, deserves Oscar consideration for Visual Effects and Production Design because visually, Laika has truly never been better. Story wise, the beats are tried and true. In many ways, “Missing Link” is a retelling of “Around The World in 80 Days.” And admittedly, here and there, one wishes the plot were willing to be a bit more adventurous. Fortunately, the film has an abundance of Monty Python-esque slapstick violence and visual puns to compensate. This is the sort of movie where someone says “could you crack open a window?” and someone smashes a window with their bare hand, misunderstanding them. There’s an art to executing dad jokes in a way that goes beyond cringe territory into genuinely hilarious comedy, and “Missing Link” nails it. The animators rarely miss an opportunity to sneak a visual gag into a scene, and it really elevates the action sequences as a result. Think Aardman style British physical comedy. There’s just so much effort put into the mis-en-scene to make the whole project funny. The voice cast is also a tremendous amount of fun. High Jackman is undoubtedly the standout, portraying a pompous buffoon who’s just likable enough to root for. Stephen Fry is amusing as a villainous anti-evolutionist aristocrat. Zoe Saldana’s character, Adelina Fortnight, could have been fleshed out more, but the filmmakers deserve kudos for taking her in an unpredictable direction during the film’s conclusion. Ultimately, the project doesn’t have the emotional heft of, say, “Up” or “Toy Story 3” that would put it at the very pinnacle of animated greatness. 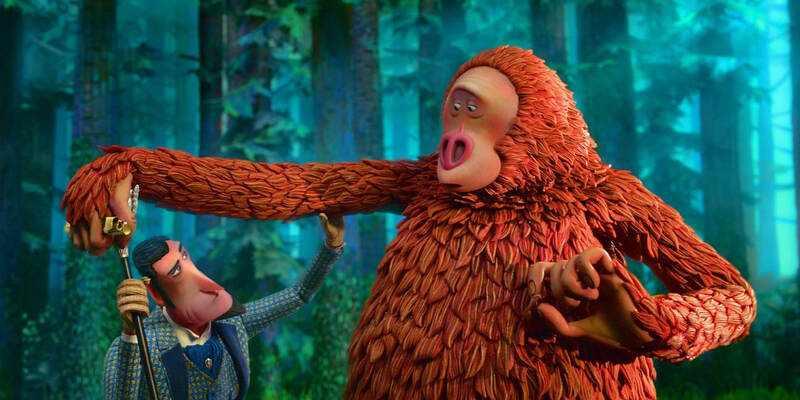 But the visual spectacle on display makes "Missing Link" a game changer for stop motion. There is so much character and charm to the film that it is impossible to watch without smiling. There was clearly a lot of sweat, blood and love poured into crafting the world we visit here. And what it lacks in emotional depth, it compensates for in sheer fun. This is prime "Saturday at the Movies" entertainment. And I for one, can’t wait to see how Laika pushes the boundaries again with their next film.